Rippled glass offers optimal aeration! Subtle ripples within the glass enhance the presentation and aeration of your wine! These aerating "waves" help to open up your wine as you pour it in the decanter, swirl, and serve. Subtle ripples within the glass enhance the presentation and aeration of your wine! These aerating "waves" help to open up your wine as you pour it in the decanter, swirl, and serve. The classic wide base gives wine plenty of breathing room, while the angled mouth provides a drip-less pour. Mouth-blown in Europe of lead-free crystal. Hand wash only. Will the "Vinturi Red Wine Aerator" fit into the Allure decanter? Will the "Ice Jacket Decanter Chiller" fit on the Allure decanter? How wide is the opening? Looking at ball stoppers and want to make sure they do not fall into the neck. Have read that it is very difficult to remove the ball if it falls into the neck. Want to make sure the ball seals it but sits on top. The glass ball stopper fits nicely and easy to remove. Where did you get the ball stopper? I have the Allure aerating decanter and am having trouble finding the stopper. How wide is the base at its widest point? BEST ANSWER: The Allure decanter at the widest point is 9 1/4". do you know where I can get the stopper for the Allure Aerating Decanter? This is truly an effective aerating design. My only complaint is that it becomes very awkward to pour the last of the wine from it. I wouldn't try to do that when serving guests. When you're down to the last glass of wine in the decanter, I'd suggest you pour it over the sink. The other option is to just add more of the same wine to bring it up to an easy pour level. I was very pleased with the delivery time. It arrived within a week of ordering - in perfect condition. I used standard delivery. I love this decanter! It is so pretty & very easy to use. I love how it swirls when you pour the wine! And yes it makes a difference in how the wine tastes, we did a taste test! I also bought the cleaning kit & use the decanter brush which works great with this product! "Down right stylish with performance"
The rippled glass looks great with and without wine. Puts on a great presentation. Overall it's user friendly and enhances the wine. It's beautiful AND it really works! I researched decanters and after reading the reviews on this one - and because it was quite nice looking - settled on this one. HIGHLY recommend getting the drying stand, it helps to eliminate unsightly water marks after washing. This decanter does what it is suppose to do. Last glass a lttle difficult to pour without drips, but just plan for that. Two solutions, pour over the sink or add another bottle. Great presentation and the swirls when filling give a unique look. I love this decanter, and I have tried numerous decanters at home and at friends' houses. The slanted top makes pouring easy, and it really aerates. The ripples do aerate the wine. Though, I don't believe as effectively as a true aerator. It has good heft and feels solid. Very easy to pour. Very stylish, and works well except when you are at the end of the bottle. Difficult to pour the last glass. Red wine looks tasty as poured in decanter. Nice decanter but it drips! Nice decanter, attractive and functional. Very disappointed that the decanter DRIPS. I need a cloth or paper towell every time I pour a glass. Good if you know you are going to pour the entire bottle in one sitting. very difficult to get the last little bit out of the decanter. Looks nice sitting on the bar. The product looks nice. Regrettably it does not work well; it is virtually impossible to pour all of the wine from this decanter without spilling ... when there is perhaps half a glass left in the vessel, you have to turn it upside down and hope the wine falls in your glass! This decanter not only works really well but it attracts a lot of positive comments even when it's not in use. Very nice product. It looks as good in the hand as it does in the picture. Great size and shape. Nice pour. This was a gift for my husband. He is very particular about what he likes and he just loves it! It is very beautiful too. We have used it one time and so far it seems very easy to use and clean. A beautiful and practical decanter! I bought this as a gift for a loved one who makes his own wine, and he loves it! Not only is it beautiful in presentation, but the inner spiral really does help aerate the wine. His vintages were good before, but served out of this they're heaven! Beautiful style, works very well. Purchase the decanter, cleaning kit, funnel and decanter holder as a gift for my husband. He loved it and also looks very nice on the table. The holder makes a very nice display for the decanter. Delivered on time and in great condition. This is really pretty- a perfect gift and seems really sturdy! I liked it so much that I bought two more as gifts! This was a gift to one of our wine connoisseur friends. We all enjoyed it over the holidays and it did allow our wine to breath and improved the taste. As with any decanter, it is tricky to clean, but it was easier than some others we used. Overall very good value. It looked good in the catalog and performs perfectly in reality. There is action in every pour, even when first decanting! A couple of young reds responded quite well. It's a nice addition to the way we entertain, even if its just the two of us. It does the trick...aerates and decants, nothing else to ask for! Brilliant. More durable than I had expected. We gave this decanter to a friend who has recently discovered good wine and didn't have one. He loves it. I have used this for every bottle of wine I have decanted recently and I just love it. The first time I saw this used was in a restaurant and I just loved how easy it was (and fun) to slosh the air into the wine. I enjoy this product very much and I think it is woth the price. Very happy with the decanter...it aerates perfectly and is a beautiful presentation. Nice decanter. I would recommend to everyone. Stylish, and serves its purpose. Absolutely beautiful and holds an entire bottle of wine. I received my first decanter as a gift from my daughter. It was accidentally broken and I’ve had several others in the meantime. This is the best from an appearance and utility perspective. It does what it was design to do while looking nice. I use this for non alcoholic drinks so that non-drinkers feel special. Easy way to decant and speed up aeriation. Pretty display on table or bar. Classic elegance for reliable performance. This is my second order for this decanter - the first one cracked with just a small bump by a wine glass. Significant change in wine taste after only about 15 mins. Difficult to completely empty - but satisfy that by adding more wine. Careful with the drips if using over a tablecloth. Difficult to pour from and drips run down the outside. Poor communication from Wine Enthusiast, and VERY difficult to report delivery problems. It does a very good job aerating the wine. We have had several broad-based decanters and ordered this one only because it was readily available. What a pleasant surprise. The item is smaller and sturdier than ones we've had previously and much, much easier to handle. Didn't notice any difference in its aeration capability from the broader ones. We are very pleased with this item. Does a great job in aerating the wine, and is visually appealing as it does. This decanter makes even inexpensive wines taste good! It's a beautiful product that works. 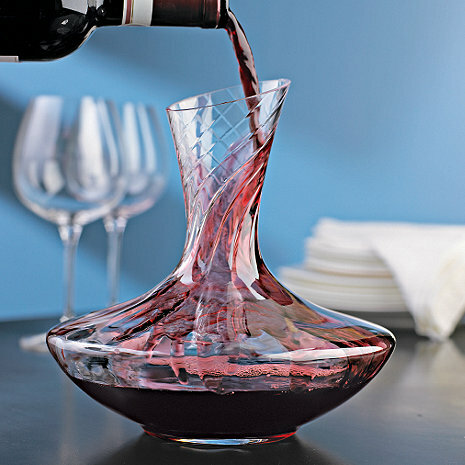 A very nice decanter with built in ridges for aerating your red wines.